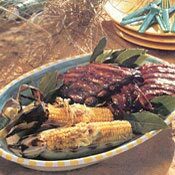 RECIPE TITLE "Tropical Barbecued Pork Ribs Recipe"
Mix 2 teaspoons of the salt, plus the pepper, and the allspice in a small bowl. Rub the ribs all over with this seasoning mix. Lay the ribs on a pan in the center of the oven or on the side of the grill away from the fire. Cover the ribs. The idea is to cook them with the gentle indirect heat of the fire. Cook the ribs for 1 hour, tending the fire as needed. TO MAKE THE SAUCE: Heat the oil in a medium saucepan, add the onion, garlic, ginger, and pepper flakes, and cook over medium heat for 15 minutes, or until the onions are soft. Add the pineapple juice, molasses, rum, tomatoes, and the remaining 1/2 teaspoon salt, and simmer for 15 to 20 minutes. Puree the sauce in a blender or food processor until smooth. After the ribs have cooked for an hour, raise the heat of the oven to 450 degrees or stoke the coals for a hotter fire. Paint the ribs with the barbecue sauce and cook for 30 to 40 minutes, basting frequently and adding more sauce as needed. The ribs should have a dark golden glaze and the meat should be tender and completely cooked. Slice the ribs and serve warm.